Other Species | Barbed Steel Charters, Inc.
Speckled trout are a great way to get the day started out on the right foot. They are generally very plentiful and easy to catch on the fly. 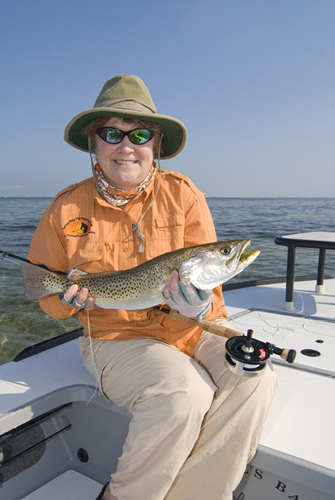 Thus Speckled trout are great for the novice to cut their teeth in saltwater fly fishing. Most “Specks” are around 12 to 17 inches in length, and will readily take a weighted fly fished over the deeper edges of the grass flats. In the winter, when the water gets to about 60 degrees, the larger trout start to move into the shallows. These “Yellow Mouths” or “Gator Trout” are generally 20 to 26 inches in length with a few specimens reaching close to 30 inches. These trout can be sight fished as they lay in ambush near sandy spots on the flats. Your presentation has to be precise and delicate in order to connect with one of these adult fish. floating line in water less than 3 feet of depth and clear intermediate sinking tip line for water deeper than 3 feet.